See the forest for the trees. : is it over yet? winter, that is? is it over yet? winter, that is? oh yeah. it hasn't even started yet. i'm DREADING it. winter. i do love the holidays, binging on my mother-in-laws amazing spritz cookies, ordering fa-la-la-la latte's & driving my husband INSANE with my harry connick jr. Christmas music. .. oh yeah. and watching a Christmas Story ("you'll shoot your eye out, kid!") and the thick, white fluffy snow coming down & resting on the trees. . .so beautiful. . .maybe i like winter more than i thought? what am i saying? halloween hasn't even happened yet! 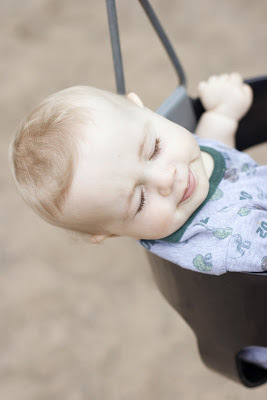 but i just love this picture of my littlest one, soaking up the sun from the swing this past summer. ahhhhhh. it will be back before we know it.